This article appeared in the Spring 2007 issue of Texoma Living!. 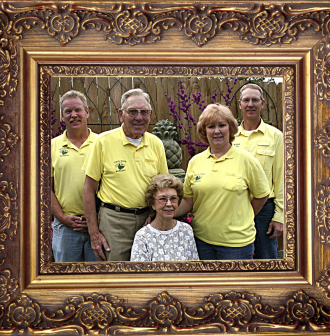 The Graham Family, founders of Denison’s Twin Oaks Nursery. (L-R) Bryan Graham, Bob Graham, Luella Graham, Linda Graham-Taube, and Bruce Graham. Graham’s sister, Linda Graham-Taube didn’t know about the name either, and she was the one telling the story before brother Bruce came in from the fields. “We’re from a little town west of Chicago called Waterman, Illinois,” she said. “My mom and dad lived there all their lives, until they moved down here.” The elder Graham ran a small town grocery in Waterman, a town of about 1,100 south of the county seat of DeKalb, home of the famous DeKalb Seed Company. The Grahams had an uncle, a major in the air force, who was stationed at Perrin AFB, and on more than one occasion the family came down to Texoma to visit. That, plus more relatives in Dallas, prompted Bruce to come south when he graduated from McHenry County Community College with a degree in horticulture. The economic opportunities in Waterman were slowing down—there was talk of the schools closing down and consolidating—so Bruce came to Texas, where he worked for a nursery company in Dallas for a year and then decided to branch out on his own. Brother Brian joined him in Denison, and the two started doing landscape and yard maintenance work. Why Denison? That’s where their grandmother lived. The brothers’ parents left Waterman and move to North Texas in 1979, and that’s when the family decided to start the nursery. Linda and her family joined them in 1992. “My husband didn’t like the cold up north,” she said. As the Grahams’ told their story, one couldn’t help but wonder if there was anyone left in Waterman, Ill. Accessories are a growing trend in gardens. We may not be up to the British level of a gnome under every bush yet, but Twin Oaks has a good selection of pottery and fountains. It’s an HGTV thing, Linda said. When the Grahams started the business, the only thing on the property was a small house. It’s still there and serves as the office. Overall, the grounds cover seven acres. Space is important, because there are more things to grow than ever before. “In the last 10 years there has been a lot of research in genetics. There have been a tremendous number of new plants and new colors introduced.” Bruce said. Some things don’t sell as well as expected, but Linda said one sure way to guarantee sales, at least around here, is to put “Texas” and “Giant” in the name. “I’ll give you an example,” she said. “Elephant ears. You buy them in a bulb form and they are one of those things where bigger is better. We have some called Texas Giant Elephant Ears. They were huge, and they were very expensive, and because they had the label Texas Giant, we couldn’t keep them in stock. Anything with the name Texas is popular.” Take that, Oklahoma. There is an old adage about how the cobbler has no shoes, and it has a parallel with the Twin Oaks Nursery business. Both Bruce and Linda admit, with just a little embarrassment, that their own yards are not exactly showplaces. “After you work here all day, get home and have supper, it’s all she wrote,” said Linda. The resource information listed above is given based on information provided by the individual business owner and has not been verified by Texoma Living!. The information was accepted at face value and no recommendation is expressed or implied by the publication. Always verify a vendor’s ability to perform the services offered and ask for as much information as might be needed to make an informed decision. Recently I had moles removed from my head. I never paid much attention to them, but my mother insisted I go to a dermatologist to have them checked.